Mix and Chic: Home tour- Simple and sophisticated vacation home on Lake Rabun! Home tour- Simple and sophisticated vacation home on Lake Rabun! 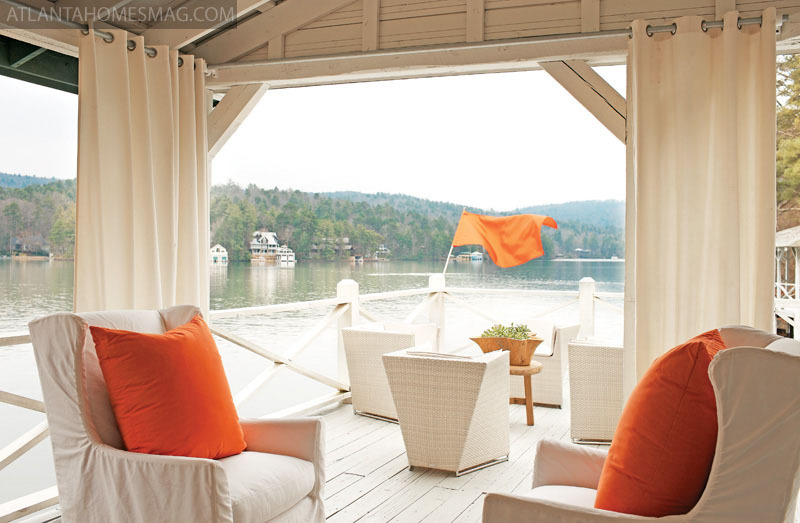 Featuring a beautiful 1920s lodge-turned-vacation home on Lake Rabun of Atlanta tastemaker Kay Douglass and her family. The living room, kitchen and a balcony that overlooks Lake Rabun. Bold and graphic pops of orange, purple and fuschia in the living room create a wonderful contrast against the white backdrop. Using bold and contrasting colors to liven up the porch. The beautiful all white kitchen incorporates two unconventional table lamps instead of regular overhead lighting for an unexpected touch. A minimalist kitchen's dining area uses two round dining tables for dining flexibility. A unique green hide instantly becomes a focal point in this charming master bedroom. Pops of blue evokes calm and relaxation in a kid's bedroom. Twin beds placed foot-to-foot to maximize space in one of the guest rooms. With pops of sunshine yellow and views of the lake, this room is a favorite among overnight guests. This inviting dock is an ideal spot for reading, relaxation and enjoying the lake view. What do you think of this charming lake house? Is there anything that grabs your eye? Hi Jessie - hope you had a great weekend, I like this lake house - would love a house on the lake. What grabs me here though must be the yellow room - that is brilliant. Wow - this is the kind of home that I would like to live in, I love crisp white clean colours and the accents just make it pop! Hiya! just LOVE the room with the green rug. GORGEOUS! I think I love everything that this talented woman ever designs. This is no exception - bright, bold colours and lots of clean open spaces, yet still with a cosy feeling. Especially grabbed by the deck by the lake - would that not be bliss? You had me at 'lake'! I would love to live on the water! 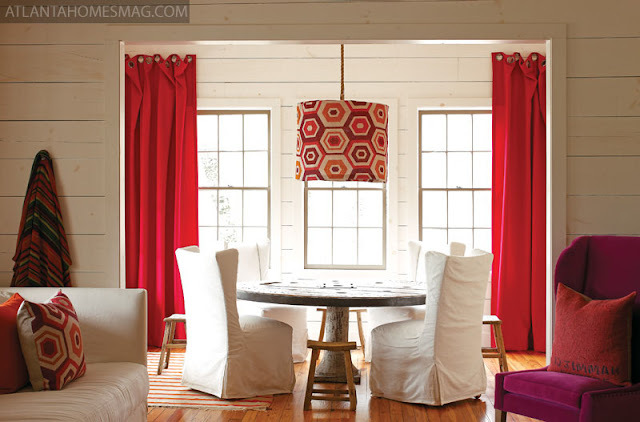 Again, I love the bright pops of colour but my favourite is those dining room chair covers and the dock area. What I particularly like is the leather seat in the living room, just changes the feel of a room and makes it seem more modern. And can't resist all that orange and yellow! Excited about your shop coming soon! Have a lovely week hon. I'm loving on that green and orange palette in room number 3. The kitchen is very pretty in it's simplicity. The wow factor, for me, lies within that bedroom accented in bright yellow. I dare anyone to not be happy in that room! Jessie, this is one of my favorite posts! I love the pristine white base and the unexpected pops of color in each and every room! It's very interesting how they've used different colour schemes for each room. If anyone needs perking up, go to the yellow room! I am loving the creative placement of beds and head boards in this home. I am in love with that kitchen! and that bedroom with the bright yellow. Actually the whole house; it's beautiful! LOVE the 2nd and the last photo! thanks for sharing! loving the colors! a lot! My favorite is definitely the porch with the orange & green! It looks like a perfect place to sit & read comfortably :) I also really like the upholstered headboards in most of the rooms. Definitely a DIY a need to tackle. Thanks for sharing I love all your home tours! Gorgeous home! The large, dramatic lighting in every room catches my eye! And I love the idea of two dining tables together! They can easily be pulled apart for extra seating. Great idea! LOVE the dock with that lake view-sooo peaceful! I adore all the neutral allowing those colors to pop (loving the green cowhide rug). 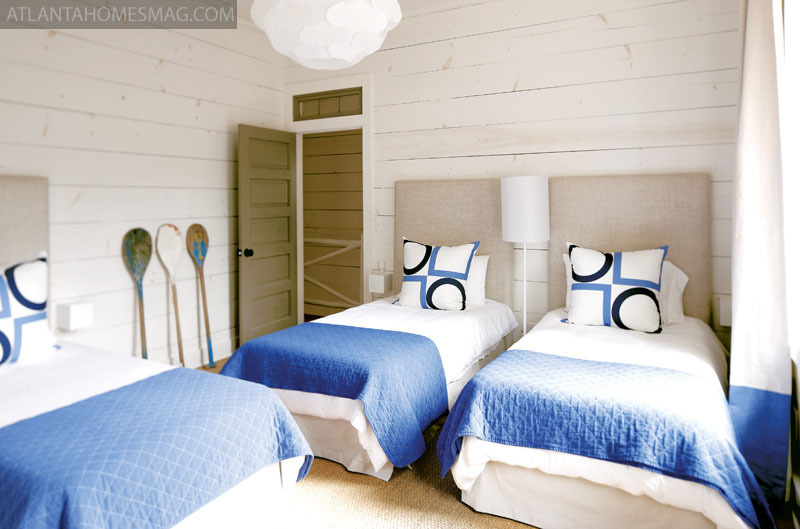 M.
All the benches and headboards in this cottage are fantastic! This place is amazing! I love the color coding! I love all the white and natural elements, combined with the small amounts of bold colour. What a stunning house! I love the pops of color and that they maximized on the view. Loving all of these bright and beautiful colors!